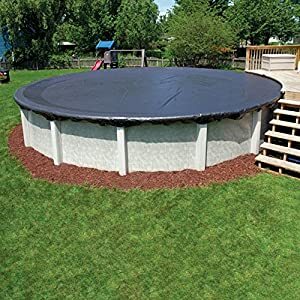 Best Pool Cover Reviews: 20 Top-Rated in April 2019! As a pool owner, you will most probably be aware of the many issues relating to pool maintenance. I will not even start with the number of pumps and treatments that a pool has to go through to be usable. A good. clean pool demands maintenance on a daily basis. One of the key elements of good pool maintenance practice is covering it for protection, as well as for heating. It doesn’t matter how big your pool is, the moment you buy one that is big enough to require a water pump for circulation and cleaning, its big enough to hold water that you don’t refill every day. Standing water is an issue; it will collect everything that nature has to throw at it, after all, its water, the source of life. There are three types of the pool cover: soft, hard and heating. I will present a review of soft and heating pool covers since the hard ones are rare to find and even rarer to use. Among the soft covers, there are two types, the above ground and inground. 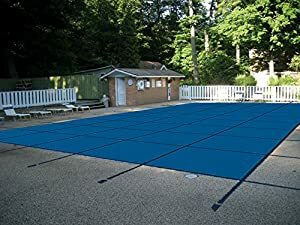 The heating covers are different materials used by manufacturers to place over the water to allow the sun to heat the pool before use; they are not protective covers. Above ground, pools are pools that are constructed above ground, usually from polymers and come with either hard sides or soft sides in various sizes. In-ground pools are constructed pools, made from cement, and are professionally built with drainage sides and a pump house. 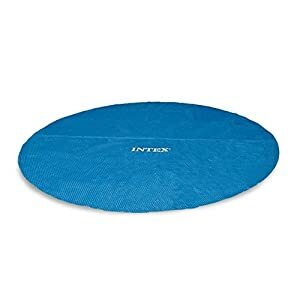 Material: the material must be thick enough and pliable enough to allow weight without sucking down such things as cats, birds, and the water cover pump to sit on it. Reliability: the tensile strength of the material even when not taut must be strong enough to withstand impact, sharp objects and the elements and not crack. Application: the way the cover is tied is key, it must be easy to apply and sturdy. Otherwise, it will be self-defeating. Now that we know what we need to look out for, let’s look at the best pool covers on the market today. 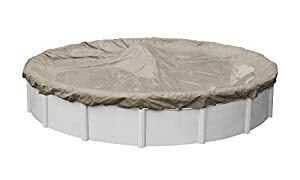 Quick note: Pools come in very specific sizes, so make sure that the cover you buy is suitable for the size you need, Never buy one that is obviously too small, but also don’t get one that is way too big or you won’t be able to secure it properly. Easy solutions produce different sized pool covers that are made of knitted polyethylene. These basic covers are perfect for covering any pool all year round. 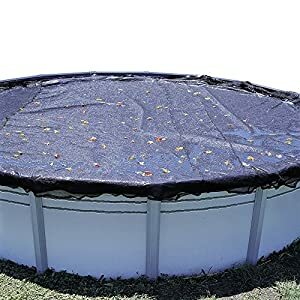 Bottom Line: his is a clever pool cover and has two layers, the basic cover for protection and the mesh cover for catching leaves and other debris. This is great when you place a pool cover pump on top to clean up the rain and snow since you just pull off the mesh and the water underneath is free of debris. 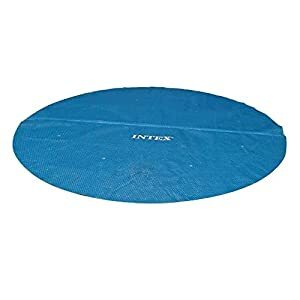 The blue wave pool cover is made of woven polyethylene and has a heavier scrim to make the cover sturdier. 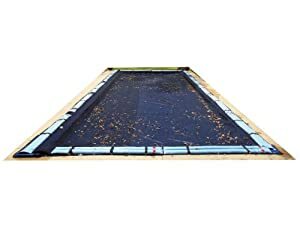 The underside is black which is proven to reduce the growth of algae, and the seams are heat sealed with UV coating treatment over the surface of the cover. This model comes with a vinyl coated cable and tightener that are held in place by metal grommets. Bottom Line: This is a “soft cover” cover, which means that even if you do manage to tighten it up, it will settle on the surface of the pool. Which means you need to make sure no animals get trapped on it when settling down on its surface. (Only cats, birds are too light and fast enough not to be caught). This also means that in the winter you will need a pool cover pump to keep excess water from accumulating. Robelle is a producer of many different pool cover styles, and if you have oval pools, then this is the cover to get. The material is a polyethylene weave that comes with a strong cable and winch to secure the surface as tightly as possible. This is a “soft cover” cover, so no matter how tight you secure it, the rain and snow will accumulate, so you need a pool cover pump. This model is made of UV resistant material, and it has a black underside to prevent algae growth. 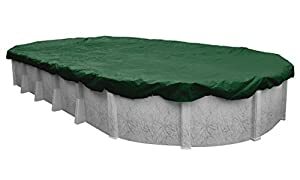 Bottom Line: This is a very good large above ground pool cover solution, and due to the oval design, it’s actually easier to put on than a round pool cover. Buffalo Blizzard provides a solid solution with their Deluxe Plus pool cover. This is a budget-friendly, solid and reliable above ground pool cover made of triple laminated polyethylene. This model comes with vinyl coated cable and winch as well as triple thick hems, and the material is UV treated to reduce algae growth. The premium model comes with extra metal grommets every 3 feet for a stronger and more secure lock. Bottom Line: Remember, all soft covers of this style must be checked regularly, and you should have a pool cover pump to take off the excess water from rain and snow that accumulates. In The Swim pool covers are great, they are made of laminated polyethylene sheeting woven with high-density polyethylene stitching and scrim. The blue version comes with steel cable and winches, making this one of the tightest and most secure pool covers around. Bottom Line: This is a hard-soft cover, which means it is less likely to sag when tightened and makes for a very secure and safe cover. Just make sure you get the right size and add a pool cover pump for extra reliability. The Pool-Mate Sandstone is a brown-colored UV protecting pool cover. 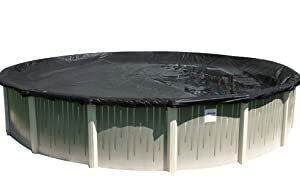 This specific model comes with extra algae resistant polyethylene surface, and when placed over properly treated water, will assure a very secure and safe cover. It also comes with water tube anchors and a five-foot overlay. Bottom Line: Since this is a soft cover, you should be prepared for rain and snow, so make sure that you have a pool cover pump. For all you engineers, I am not going to discuss the sub atomic properties of bubble foam or solid fabric heaters. These are simply water covers used to help heat the water from sunlight. I am listing the best that were tested for durability, reliability and price. Intex is a world-famous brand name that produces excellent equipment and accessories. This is one of their solar pool covers and comes with added heating potential apart from protection. 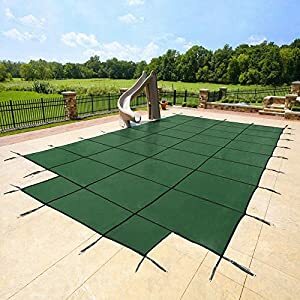 This pool heating cover is simple to use, just place it on the water and come back when you want to use the pool. This is also a great cover when you are not using the pool during daylight hours and intend to use the pool sporadically during the day. Bottom Line: There are two types of solar cover, the solid weave polymer covers, and the bubble wrap covers. They both work, it’s just a matter of preference. I personally prefer the solid polymer cover since it is sturdier and longer lasting. 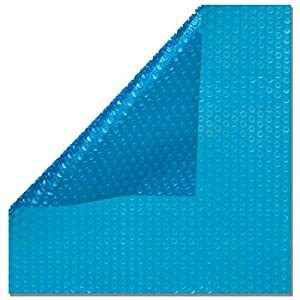 This is Blue Waves 14mm solar blanket made of air-filled cells, what I call bubble wrap. It’s effective, light and easy to put on and take off. This one was made large enough to cover inground pools. Bottom Line: This is a lot of bubble wrap, so make sure your pool is totally covered. This is the “bubble wrap” version of solar heating. 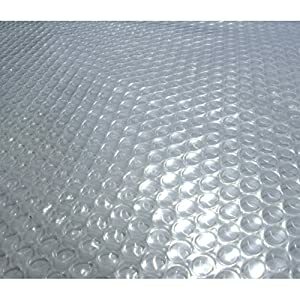 Bubble wrap solar covers are made of a clear cell polymer that protects against UV. They are thicker than the solid weave solar covers but can be lighter since they are primarily made of air trapped in thin cell membranes. Bottom Line: You don’t need to find an exact cover to suit your pool, just enough to cover most of the water surface, preferably a little bigger than the pool surface so that heat is trapped inside and reflected back off the cover. This is In The Swim’s solar bubble wrap blanket. It is made of a thin, yet sturdy UV stabilized resin and is only 12mm thick. Bottom Line: If it is simple, clean, and easy to apply, then take it. 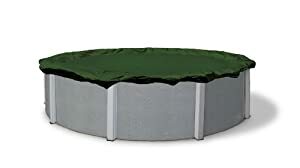 This is all of that and more, you get great value for money, and if your pool is round just make sure the diameter fits into the square because you need to cover the entire water surface for the best results. If it’s a bit of color and fun for your pool than the Solar Sun Ring Water Anchor is the one for you. This is a double layer UV resistant vinyl. The top layer is clear allowing the sunlight to reach in and heat up the cells, the second layer is blue, which traps the sunlight from reflecting out of the surface of the pool. Bottom Line: Don’t over inflate this model but other than that, it’s cool for small pools. This is another Intex solar cover for your pool. 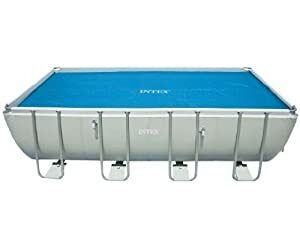 It’s always best to buy an Intex cover for an Intex pool since they are designed for the specific surface measurements. This model is made of 160-micron polymer weave. Bottom Line: If you have an Intex, don’t buy anything but Intex accessories. The Blue Wave produced this quality UV resistant pool heating material. It’s a solar blanket made like bubble wrap wit 12mm transparent polymer that will trap the heat and raise your pool’s water temperature by 15oF. So they claim. Bottom Line: This is another nice swash of heating material designed for pools. It comes with a 5-year warranty and is budget-friendly too. Easy to fold and store. This is the Intex solar heating pool cover for 15’pools. It’s made of Intex proprietary PVC and helps to heat up as well as protect your pool before use. This is not a pool cover, only a solar cover for heating. Bottom Line: Not much to add, use it on all Intex or any pool that is 15’ or smaller. If you have an in-ground pool, then it will most probably be big enough to warrant a special accessory for laying the pool cover over it. The bigger the pool, the more people you need to help cover it. With a really large pool, the optimum number of people is 4, where two start off on either side, pulling the cover, and then 2 more help by securing the end, creating a measured tightness over the pool. 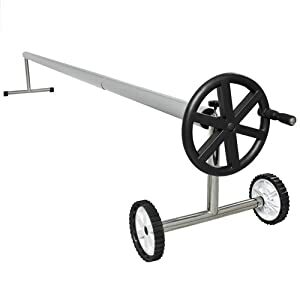 However, there are solutions to such manpower issues, and one of them is the Best Choice Products, Pool Reel. Just as with any pool cover, you need to make sure the measurements fit your pool. This model’s dimensions are good for covering a 17.5′ ft – 21′ ft long pool. The reel weighs 19.2 and is sturdy enough to hold up to 140 Lbs of cover weight. 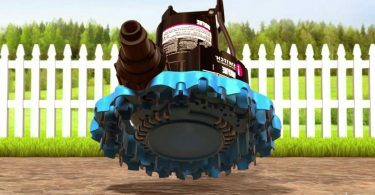 If you are seeking a rust-free , easy to crank and cover the pool with only one person at the controls, then this is the unit for you. If you already invested in a pool that warrants a model this big, then it’s a good accessory to invest in, even if you have a pool hand to manage everything. Life is easier with accessories. An inground pool is an investment. When you build a full-sized in-ground pool, you are planning for a lifetime of enjoyment. However, with enjoyment comes maintenance, and that is why you need a proper reliable and sturdy pool cover. 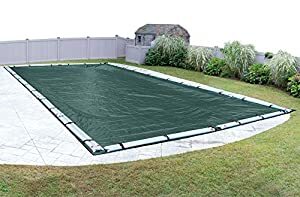 The Yard Guard is an exceptional pool cover that comes with reinforced webbing and seams as well as rub strips on the seams for added protection. The material is a canvas mesh polyester that is secured by thick reinforced straps that lock onto metal links. This model is coated with algae resistant materials. Once secured in place, the surface is as tight as a trampoline, although I wouldn’t bounce on it, anyway. The features you get include a white thread, triple stitched cross tack and box tack for all stress points. Straps are running at all ends of the cover. Raised rub strips on all the side seams. Bottom Line: This is one of the most secure pool safety covers I have found on the market. Their strip lock method provides an extra taut grip and maintains the cover’s integrity and tensile strength all season. This is a great value for the money buy. You can walk on this one without worries, but I wouldn’t try to tempt fate. The blue wave pool cover for in-ground pools uses weighted sidings to keep the cover in place. This model comes with their special arctic armor cover that withstands extreme colds and won’t crack. The weave is extremely tight, and the cover is treated with an anti-algae treatment. The cover comes with a 4-foot overlap and secured water weighted tubes. Bottom Line: This pool cover is a great middle-range priced cover, cheaper than most models, it is not as secure as a tight grip/fasten unit. This unit only relies on the water-filled tubes, as such, so don’t try walking on it, ever! The Water Warden is a fixed grip inground pool safety cover. This means that the sides are all held and locked into place using reinforced straps and links to ground-placed holding pins. The material is supported by a triple-stitched and double-strapped top and underside. The Water Warden comes with stainless steel springs, brass tack, and aluminum locking holders. The D-springs make it easy to connect the cover under stress and thereby makes it a secure safety cover. You can walk on this one after you secure it, although, again, I wouldn’t tempt fate (too many Hollywood movies in mind). The material and treatment are UL Classified in accordance with ASTM standard F 1346-91(E481874). This model weighs 67 Lbs. Bottom Line: A fine cover, really solid and reliable. The Robelle water cover uses water-filled tubes as weights to lock the cover in place. This is a lightweight cover, weighing in at 21 Lbs and is easy to cover and secure. However, since it’s not a locking cover, you cannot walk on it. This cover is made of polyethylene and treated to resist UV and stop algae growth. Bottom Line: A good value for money, but make sure your kids keep away from this in the winter. These are lightweight, but make sure you get a strong version since they can support hundreds of pounds of weight when fabricated properly. Since they are mesh, they are not so useful in the winter, where rain and snow can fill the pool to overflowing. These are primarily seasonal covers against leaves and large particles. However, dust particles can get through. If your pool is empty in the winter, then this is a great cover to keep the pool clean while allowing rain and snow to accumulate. During the summer, these mesh covers stop UV which is important for stopping algae growth. These are made of strong thick, durable polymers and are used to cover your pool when the pool is still filled with water. The concept is that you don’t want anything to get in your pool, as such, only a sealed surface will provide that cover. 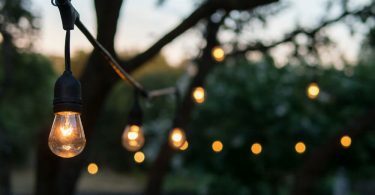 In season, you want an easy to cover and remove cover at night. In the winter and off-season, you want a very strong durable cover that can be anchored well. A good cover is a cover you can walk on. Solid pool covers will need a pool cover pump in the winter since they will accumulate rainwater and snow. During the summer they are only covering the pool to keep it clean overnight, however, in the winter and offseason, they can be covering a pool for months. Unlike mesh covers that require a quick wash, solid pool covers require maintenance. This maintenance means you need to clean them from accumulating dust and moisture once in a while. Moisture will lead to a growth in bacteria that can eat through the surface material. While they do stop the growth of algae, they are susceptible to other threats. You should consider the animal population too, are there many cats, dogs, and feral creatures? If so, will your cover be secure against their added weight walking over it? Will your cover resist scratching? The idea is that if you closed your pool when the water was crystal clear, it would be crystal clear when you open it up. This means that you need to clean your water before closing the pool for the winter. When I say clean, I mean truly clean, crystal clear. Fact: around 3,536 people drown every year in the United States. Of which, the majority are under the age of 5 years. Inground Pools must be properly fenced or guarded when not in use. However, even when there is no warning or security measure in place, you need to make sure the cover is properly secured. The best pool covers are those that have hooks and locks for secure anchoring. These will support a youngster and are also so taut that the kid cannot crawl under the cover. When buying a pool cover, make sure you buy from a reputable firm. Do not buy cheap imports that can be made of poisonous materials. The best way of checking your pool accessories is to see if they have ASTM International compliance. ASTM International is a non-profit organization that employs over 30,000 expert members to develop and create industry standards for consumer safety. One way of knowing if a pool product is ASTM certified is to seek out the Underwriters Laboratories (UL®) sign. This sign ensures the product you buy conforms to ASTM standards. Really helpful guideline. To protect child from accident due to insecure pool. It’s really important to have a pool safety equipment. Thanks for best pool cover guideline to choose right one.